Abstract: Metabasites with evidence for breakdown of former eclogites and recrystallization under granulite facies conditions occur in the Dumbier Crystalline Complex of the Low Tatra Mountains, Central Western Carpathains. Textural relationships, phase equilibrium modelling and thermobarometry have been used to determine the P-T evolution of these rocks. Omphacite diagnostic for the eclogites facies stage is absent but its former presence is inferred from the symplectitic intergrowths of clinopyroxene+plagioclase. The re-equilibration in high-pressure granulite facies conditions is demonstrated by the assemblage garnet+clinopyroxene (<10 % Jd)+plagioclase+quartz. The phase equilibrium modelling using THERIAK-DOMINO program and conventional geothermobarometry suggest the P-T conditions of 750–760 °C and 1.1–1.5 GPa for the high-pressure granulite stage. Orthopyroxene formed in the clinopyroxene + plagioclase symplectites and kelyphites and coronas around garnet at P-T conditions of ca. 0.7–1.0 GPa and 650–700 °C. P-T evolution of granulitized eclogites is interpreted as the result of two metamorphic events; early Variscan eclogite facies metamorphism was followed by granulite facies thermal overprint in the Carboniferous time. The second metamorphic event was crucial for breakdown of eclogites, these are only seldom preserved in the pre-Alpine basement of the Western Carpathians. 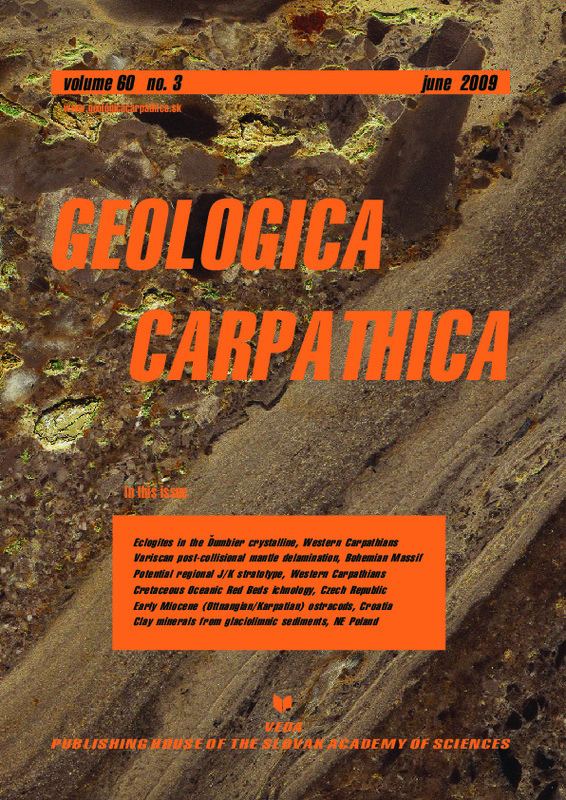 Abstract: On the basis of the synchronicity of geochronological data and the similarity of granite types, it is proposed that the mid-Carboniferous Fichtelgebirge/Erzgebirge Batholith in the Saxothuringian Zone of the central European Variscan Fold Belt and the South Bohemian Batholith in the Moldanubian Zone (including the intervening Oberpfalz and Bavarian Forest granite areas) belong to one coherent and cogenetic, ca. 400 km long plutonic megastructure. Unlike older (syn-collisional) plutonic structures in the Bohemian Massif, this Saxo-Danubian Granite Belt (nov. nom.) has developed discordant to the Devonian/Early Carboniferous collision-related tectonic architecture of the Bohemian Massif. It is argued that the Saxo-Danubian Granite Belt formed in response to a post-collisional detachment of lithospheric mantle below the south-western sector of the Bohemian Massif. Abstract: Compared to coeval successions from the Carpathians, the continuous Jurassic-Cretaceous (J/K) pelagic limestone succession of the Brodno section offers the best possibility to document the J/K passage in a wide area. This section comprises a complete calpionellid, and nannofossil stratigraphic record, that supports the older paleomagnetic data. Moreover, the sequence stratigraphy and stable isotope (δ18O, δ13C) data gave important results, too, enabling comparison with known key sections from the Mediterranean Tethys area. Abstract: Large differences in the intensity and overall character of bioturbational structures were found in five facies containing hemipelagic red beds. Red beds (CORB) of the Godula facies of the Silesian Unit and their equivalents (mostly not red) in the Kelc facies of the Silesian Unit and the CORB in the non-calcareous sediments of the Raca Unit display a very low degree of bioturbation. The CORB facies of the Raca Unit, containing calcareous intercalations, displays a very high degree of bioturbation as expressed by a high ichnofabric index. They contain trace fossils Chondrites, Zoophycos, Planolites, Thalassinoides, Palaeophycus, Teichichnus and Phycosiphon. The supply of food obviously acted as the controlling factor. The “calcareous” facies of the CORB of the Raca Unit has a considerably higher proportion of sand-dominated interbeds and also carbonates than the non-calcareous facies. This (especially the presence of carbonates) suggests a relative proximity of food-rich environments and an easy transport of nutrition-rich substrate by turbidite currents into the basin directly, not only by periodical fall-out of dead plankton (which is probably responsible for the rhythmicity of poor colonization horizons in weakly bioturbated units). Abstract: The study of the Early Miocene (Late Ottnangian/Early Karpatian) ostracod fauna from the Sadovi section (Mt Pozeska gora, Croatia) led to several results concerning Neogene paleobiogeography and paleoecology. Brackish deposits of Late Ottnangian and Early Karpatian age have been recognized for the first time in the North Croatian Basin. These deposits indicate the first marine ingression into the Early Miocene lake in this area. Twenty-nine ostracod species were determined, including the new taxa Fabaeformiscandona slavonica nov. sp. and Herpetocypris sadovii nov. sp. Abstract: Glaciolimnic deposits sampled from three sedimentation reservoirs located on the Sepopolska Plain (north-eastern Poland) were investigated. The material under study was deposited in the recession phase of the Pomeranian phase of Vistula (Weichselian) glaciation. The clay fraction was separated by centrifugation after preparation according to Jackson. Mineralogical investigations were done by X-ray diffraction. The analysed deposits had a similar complex composition of clay minerals. The main components were illites mixed with the illite/smectite mineral with percentages <10 % S. Another part were minerals of the illite/smectite type which had differentiated content of smectite layers (mainly 80–90 % S). There were also chlorite minerals, probably as mixed layer minerals of the chlorite/vermiculite type or HIV with a negligible amount of chlorite layers. The results indicated that all the deposits were of the same age as well as similar deposited material and the samples are different from typical Pomeranian till and typical limnic material of the same age. Small differences observed among the deposits of specific sedimentation reservoirs were probably the result of later processes.